If you want wild boar hunts that will get your heart pumping then you found the right place. Our hunts include TWO BOAR A DAY, BOBCAT, COYOTES, HOME COOKED MEALS AND GREAT LODGING. If you want hog meat or trophies, you can get it here. 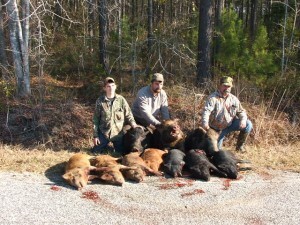 We now have acquired 10,000 acres of private land for our free roaming wild boar hunts South Carolina. We hunt from baited tree stands, ground blinds or with dogs. Any weapon can be used together or seperate. Your choice. Some spotlighting is allowed as well. Call Joe for details.